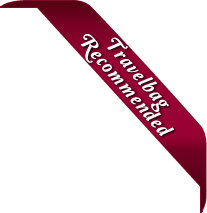 Travelbag offers a wide and varied selection of fantastic hotels in Ras Al Khaimah to meet all of your discernible needs. Whether you are travelling on a budget and require a cheap hotel, seeking something to accommodate the entire family in comfort, or treating yourself to a luxuriously appointed resort, Travelbag pledges to offer a Ras Al Khaimah hotel to suit everyone. 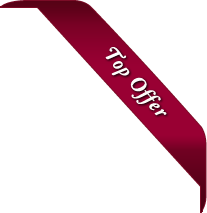 With our excellent up-to-the-minute deals, superb quality line-up of hotels and resorts, and commitment for value-for-money, Travelbag is certain to have something to meet every budget, requirement and preference. Here is just a selection of our favourite and cheapest hotels in Ras Al Khaimah. Please use our search panel above to find your perfect choice. Settled deep in the business district within Dubai’s bustling city centre, the Hilton Ras Al Khaimah Resort & Spa is an opulent urban getaway that invites travellers the world over to indulge in the sights of the UAE’s most populous city while also revelling in a setting of modern luxury, ... generous amounts of space and convenience as well as an attentive level of service that is sure to appeal to even the most discerning of adventurers. 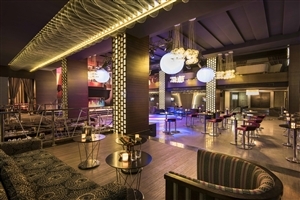 The hotel provides easy access to surrounding shopping outlets, entertainment hotspots and the beautiful beach all waiting to be discovered by avid explorers, while the many in-house facilities and beach facilities of the nearby DoubleTree by Hilton Resort and Spa Marjan are just the necessary elements for a truly memorable occasion. Situated in a beautiful vantage point looking out over the beauty and splendour of Ras Al Khaimah’s coast, the DoubleTree by Hilton Resort & Spa Marjan Island provides comfort, style and convenience to travellers looking to sample some of the wonders the UAE has to offer. Elegantly designed with hints ... of luxury all throughout, the resort serves as a great place for romantic couples, family adventurers and business travellers to settle in and make the most of their surroundings. 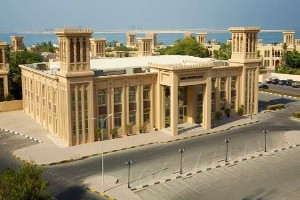 Spend time exploring the nearby sights of entertainment outlets of Marjan Island and the Al Hamra Mall, ease back upon the soft sands of the private beach or utilise any one of the many soothing and recreational facilities the hotel has to offer for an unforgettable time in this utopian destination. 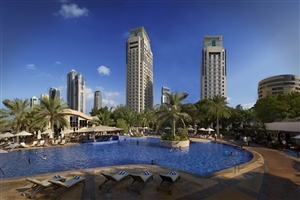 Fringed by a glorious white sand beach and the Arabian Sea beyond, the Hilton Al Hamra Beach & Golf Resort offers five-star family-friendly accommodation in an enchanting Ras Al Khaimah location. Savour high quality Arabian hospitality and service as you relax in your spacious and well-appointed guestroom or suite, before ... stepping out onto the beach to savour the year-round sunshine. Facilities at Hilton Al Hamra Beach & Golf Resort include a Spa, swimming pools, watersports, and sports activities, while guests can choose from an array of excellent bars and restaurants. 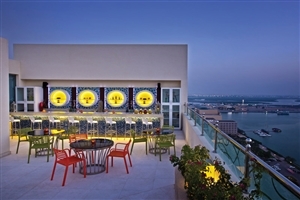 Situated on a stunning beachfront in the intimately small Emirate of Ras Al Khaiman, the Cove Rotana serves as an idyllic haven where the enriched culture of Arabia and a sense of tradition combines with modern comforts, an attentive level of service and luxurious comforts to create a truly blissful ... escape. Looking out over the Arabian Gulf and fronted by pristine sands, this establishment sets the tone for what is sure to be a memorable holiday experience in the northenmost part of the UAE. Consisting of a number of lavishly designed villas, family adventurers, group travellers and romantic couples are treated to a world of privacy and comfort, not to mention the many world-class facilities on offer both inside and out of the resort, making this a fantastic destination for those seeking something truly spectacular when considering a holiday in the UAE. A distinctive fixture of Ras Al Khaimah’s glittering coastline, the Waldorf Astoria Ras Al Khaimah brings the brand’s renowned standards of luxury and quality to a spectacular Arabian setting. Set overlooking the Arabian Sea and fringed by 350m of private white sand beach, Waldorf Astoria Ras Al Khaimah represents an ... excellent choice for the discerning traveller seeking a luxurious Arabian hospitality experience in a more relaxing setting. 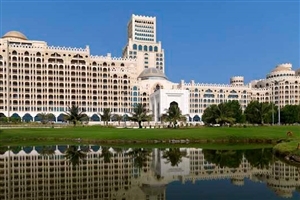 With its sophisticated guestrooms and suites, wide choice of gourmet dining venues and superb facilities, including the Al Hamra 18-hole championship golf course, Waldorf Astoria Ras Al Khaimah offers uncompromising five-star splendour in a location just 50mins from Dubai International Airport. Settled atop the soft, white sands of the serene Marjan Island, the Rixos Bab Al Bahr serves as an idyllic beachfront escape that boasts of incredible luxury, amazing style, an attentive level of service and a truly awe-inspiring view. Designed with consideration and care so as to appeal to everyone ... from romantic couples, adventuring families and business travellers alike, the resort is the perfect place to ease back and let the soothing ambiance of the Ras al-Khaimah wash over you. Spend time exploring the glorious beach, dine fine in one of the many in-house restaurants or pass the time with the numerous facilities on offer to really get the full experience of this UAE oasis. Amid stretches of desert sand in tranquil Wadi Khadeja, an oasis of peace awaits at Al Wadi Desert, A Ritz Carlton Hotel. A sanctuary surrounded by the evergreen ghaf tree, it is the first desert resort in the United Arab Emirates to offer all-pool villas. Experience magical Arabian nights and ... the romance of living like the nomads of yore, complete with Asian-inspired hydrotherapy spa facilities, a dedicated nature reserve, a private beach club and an 18-hole championship golf course. An Arabian wildlife experience awaits within the nature reserve, home to local desert fauna such as Arabian gazelles, camels and oryxes, offering guests a unique opportunity to interact with and observe these gentle creatures up close. Bringing together some of the finest aspects one needs for a truly romantic sojourn, the Banyan Tree Ras Al Khaimah Beach invites travellers to indulge in sumptuous comforts, modern commodities and a great level of service, all enhanced by views of the tropical palms, soft, powdery sands and the vast, ... blue waters of the Arabian Gulf. Situated on a private peninsula in the stunning Al Jazira Hamrah enclave of the Ras Al Khaimah province, this elegant all-villa getaway serves as a modern oasis amongst the splendour of the UAE. Housing a total of 32 luxurious villas, each of which sport views of the stunning surroundings, this desert getaway is just the thing for those looking to unwind in style, and with so much potential for exploring, avid adventurers are sure to find vantage points and private hotspots all around. Whether it’s for adventure or rejuvenation, the Banyan Tree Ras Al Khaimah Beach is happy to accommodate.